These look so cozy for Autumn, I can only imagine the comfort and warmth curling up on a custom knit chair designed by Melanie Porter in the UK. Today Melanie shared her collection with me and I just had to post about this because I did promise I'd lay off the wedding-related content so I'm onto chairs now. :) Who knows where my next blog post will take us, I'm constantly flipping around like this. You too? Thing is, there is so much out there to be inspired by that one never needs to draw a line -- if something inspires, no matter what it is, that's just how it goes. Your design compass points and well, you simply must follow! 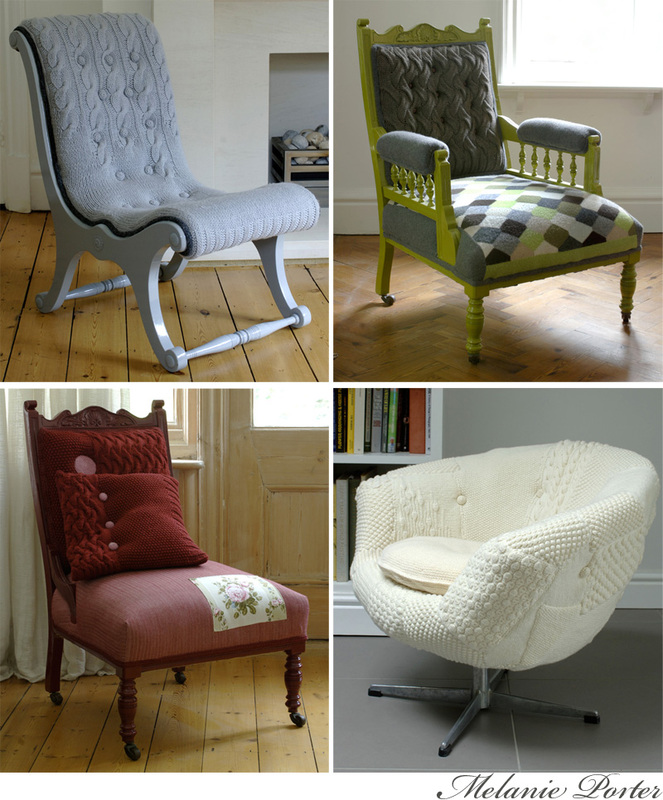 About Melanie's work -- in her own words, "Each project starts with the chair itself – anything from an antique Victorian nursing chair, to a 1970s Egg chair – which is painstakingly stripped back to the frame, before being restored and reupholstered using traditional techniques. This blank canvas is then covered with a series of hand-knitted panels, especially created for each chair." What a process, sounds like a lot of work but a piece that someone would cherish for life. Would you love to have her whip up a custom chair for you? Me, me me! Yes!